Listen here for audio of radio interviews about films from a Christian perspective with Pastors Ted Giese and Todd Wilken on IssuesEtc.org where Christianity meets culture. This review contains some spoilers. 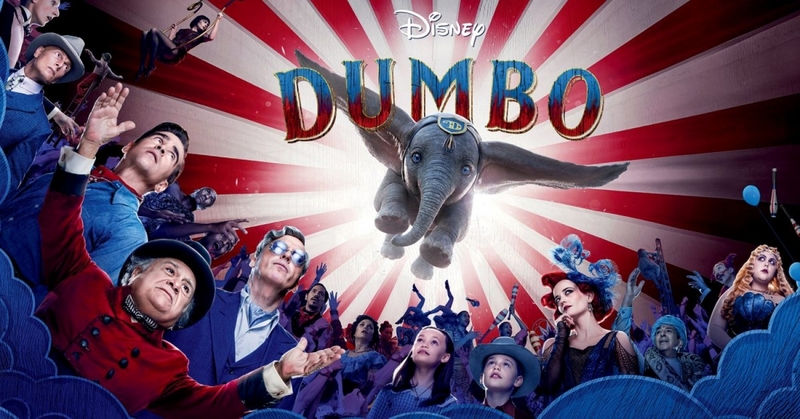 Set in post-WWI America Dumbo (2019) is the story of a baby circus elephant with enormous ears who loses his mom but learns to fly. He first flies with the help of a grieving circus family. 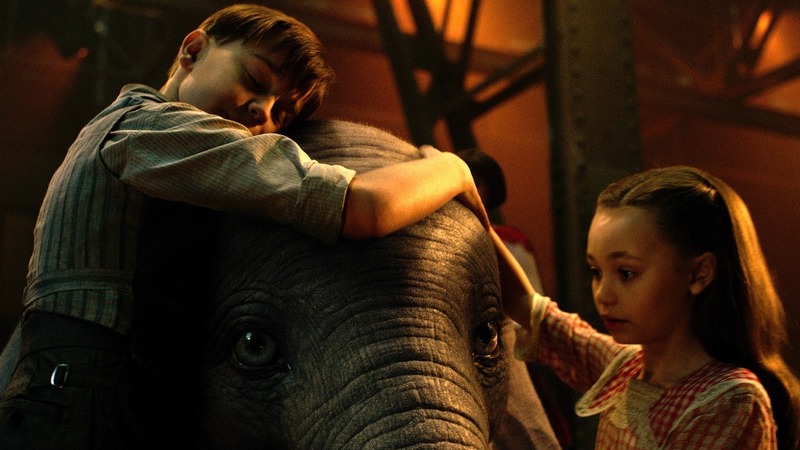 Like Dumbo the family’s children, Milly (Nico Parker) and Joe (Finley Hobbins), have lost their mom, and together they discover that the elephant’s fascination with feathers helps him fly. Under the care of their trick horse-riding father, WWI veteran Capt. 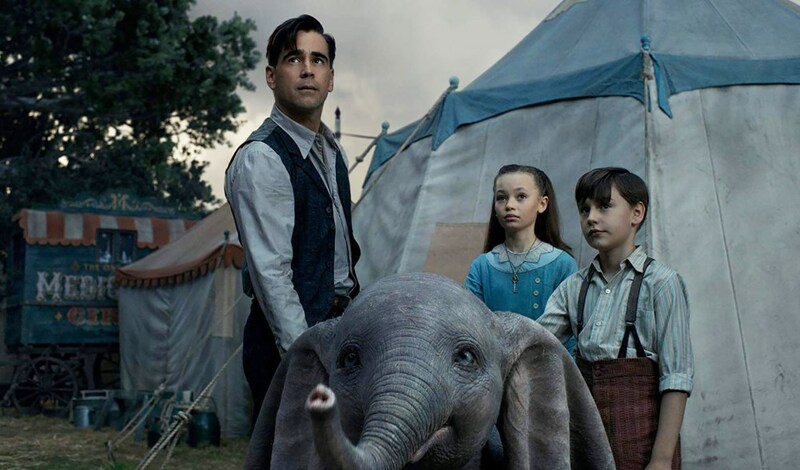 Holt Farrier (Colin Farrell) the children help Dumbo navigate the attention he receives for his peculiar ability and eventually assist in reuniting him with his mother Mrs. Jumbo who unlike their mother, who had died of influenza, is still very much alive. 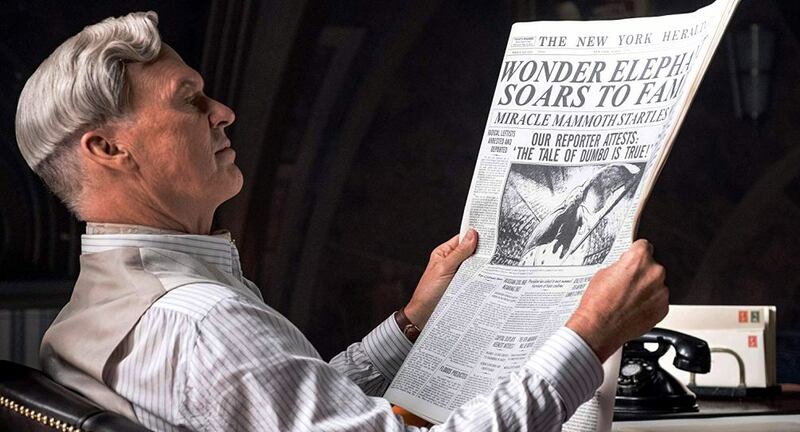 When news of Dumbo’s flying ability hits the newspapers a big-time circus promoter, V. A. Vandevere (Michael Keaton), approaches the man running Dumbo’s small traveling circus, Max Medici (Danny DeVito), and offers to move the entire circus to a Disneyland-style amusement park called Dreamland complete with its very own circus. 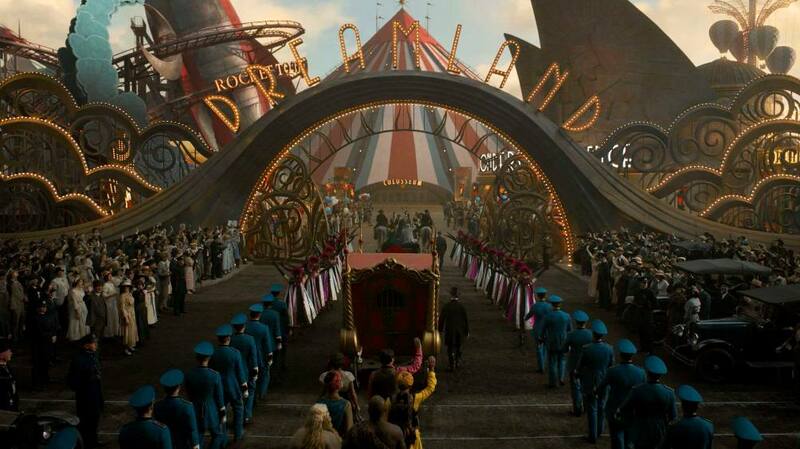 There Dumbo joins a trapeze act with Vandevere’s “girlfriend” Colette Marchant (Eva Green). But all is not well under the big top. The rest of Medici’s circus performers languish while it becomes apparent Vandevere’s financial backer, J. Griffin Remington (Alan Arkin), is more interested in a return on his investment than in safety by pressing Dumbo and Marchant into dangerous stunts just to fill seats. 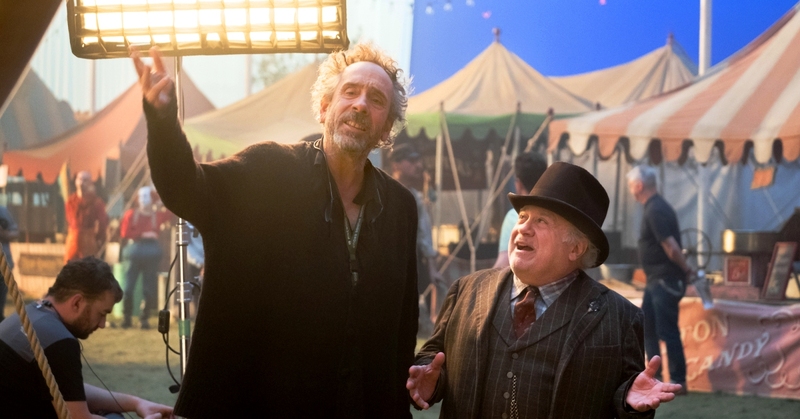 Tim Burton, the director of films like Beetlejuice (1988), Edward Scissorhands (1990), Ed Wood (1994),Big Fish (2003), Alice in Wonderland (2010) and Miss Peregrine's Home for Peculiar Children (2016) and his involvement with animated projects like The Nightmare Before Christmas (1993), James and the Giant Peach (1996) and Corpse Bride (2005), would seem the ideal choice for a movie about an outsider, set in a circus with a travelling freak show and clowns. Yet somehow the energy and vitality and the sense of special care toward the homely and odd characters lacks authenticity in Dumbo. Perhaps it’s because the film avoids taking risks. At one point while a giant crowd waits for Dumbo and the trapeze artist Marchant to perform, Medici asks, “where are the nets? I cannot see them.” Vandevere responds, “the nets are invisible.” There are no nets to protect a falling performer. Burton’s film however is populated with enough invisible safety nets to avoid offending or hurting anyone. For example: set after WWI there are steam locomotives shown without the shovels of coal being thrown into the engine in case showing coal might offend environmentalists; the eldest daughter Milly, on the cusp of her teenage years, is more interested in science than in finding love, getting married, and having a family thereby satisfying the feminists and science lobby; in the original cartoon while the infamous “Pink Elephants on Parade” scene resulted from Dumbo’s hallucinations following his accidental drinking of champagne, in this film they are still present but not because of alcohol. It seems all these examples demonstrate Disney’s and Burton’s reluctance to remain true to their source material, and/or the time in which the film is set, to avoid the risk of offending audiences or critics. Christian viewers will enjoy the film’s emphasis on family and the way in which Dumbo—despite his oddities—is cherished by those who love him as an adopted part of the family. Two small connected religious elements are placed in the film that Christian families may want to be aware of. They go by quickly. Upon discovering Dumbo’s ability to fly, one of the Medici circus’ sideshow performers Roshan Seth (Pramesh Singh) an East Indian/South Asian snake charmer, comments how the gods can manifest themselves in animals. Later in the film Mrs. Jumbo is found in Dreamland chained up in a zoo-like exhibit and painted to look like the Hindu goddess Kali the Destroyer complete with a sign. 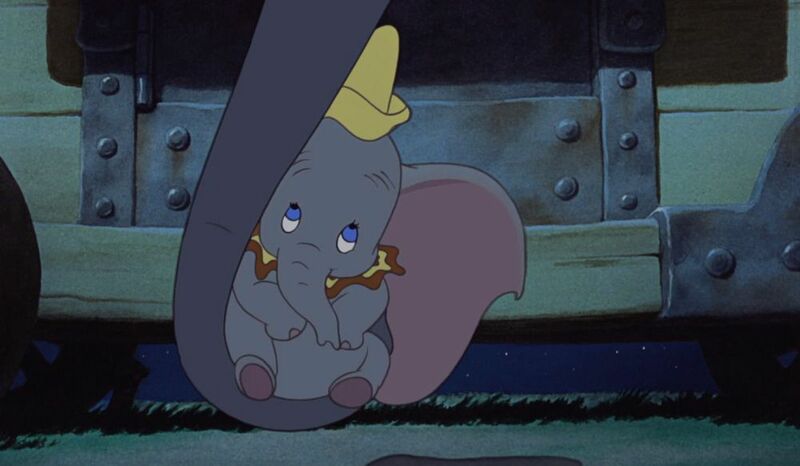 At 61 minutes the 1941 animated Dumbo is the shortest feature-length Disney movie. At the time Walt was advised to extend the storyline, but he is purported to have said, "You can stretch a story just so far and after that it won't hold together." At 112 minutes Dumbo (2019) feels like it’s been stretched a bit too far. Adding the grieving Farrier family provides empathy when it comes to the storyline of Mrs. Jumbo and her separation from Dumbo, and next to Dumbo the children Milly and Joe are the film’s most consistently altruistic characters. However they replace both Timothy the talking mouse from the 1941 version of the film and the crows who gave Dumbo his magic feather. The crows certainly present a problem to modern audiences and likely did to the African American community back in 1941. Making changes to an artistic property is within the rights of the copyright holder and their creative team, and not all changes are bad; the question is why and how are they made? 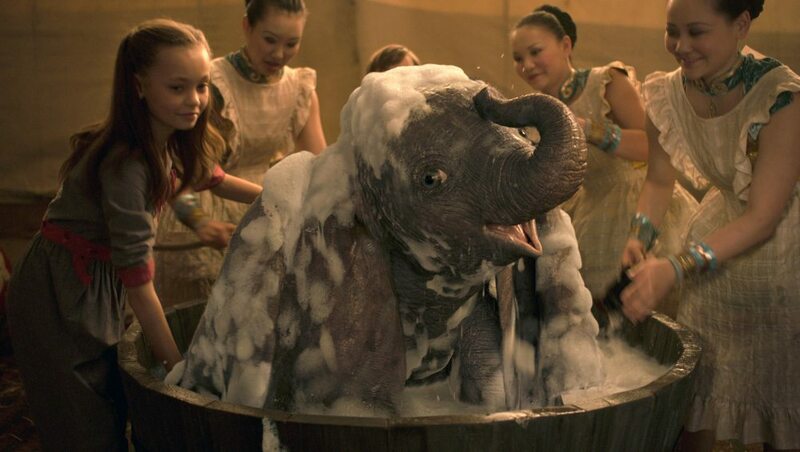 The choice to make many of the talking animal characters from the original film into non-speaking parts lets some of the air out of the Aesop’s Fable quality and character of the original Dumbo. 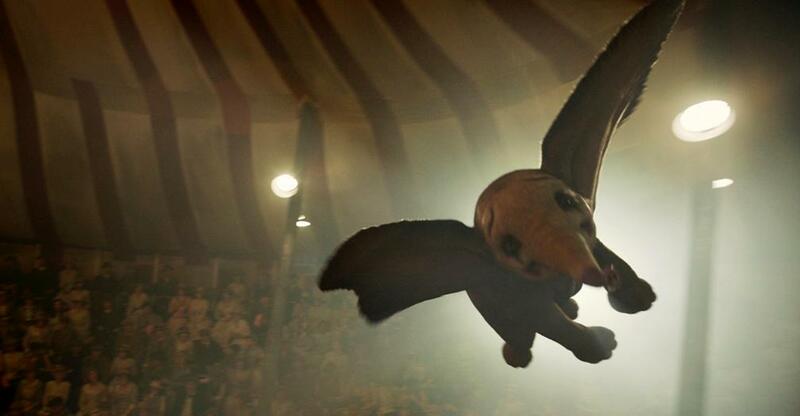 It also removes some of the film’s heart as the warm melancholic lullaby “Baby Mine” originally sung by Mrs. Jumbo to Dumbo is now sung by one of the circus sideshow freaks. It changes the song from being loving advice from mother to child into an outsider’s description of unfolding events. This is an odd choice since Disney isn’t averse to including talking animals in their “live action” remakes. The upcoming remake of The Lion King (2019) features the voice of James Earl Jones as Mufasa, so it’s a head scratcher as to why they chose to write those lovable characters out of this film. Even though it was number one at the box office on its opening weekend Dumbo has failed to meet Disney’s expectations. Contributing factors may be its failure to satisfy the fans of the original while at the same time missing the point that the story is about taking risks. Dumbo has to learn to fly without his magic feather because in truth the feather is not magic—he always had the ability to fly. This theme from the 1941 Disney version seems tailor made for current Hollywood, yet the film is crippled by Hollywood’s ardent devotion to the equally powerful ideals of political correctness. Instead of taking some risks to tackle the challenging quirks and oddities of the original animated film, this Dumbo plays it safe creatively. Burton’s creativity is clearly present in the film’s look however it doesn’t matter how pretty the feather looks because for many viewers this Dumbo will fail to fly.